Today we’re discussing destiny—your soul purpose for being here and your true life’s calling. Sometimes we can see clues about our life’s calling when looking in hindsight at our childhood or past. I’m going to share two stories from my past that serve as examples, little hints that I was meant to do the work I’m now doing. 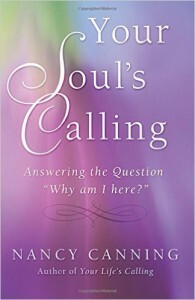 And past guest Nancy Canning talks about her new book, Your Soul’s Calling: Answering the Question Why Am I Here? What does your soul want you to know? Within each and every one of us is an urging – a calling – of how to be and what to do in this lifetime. And yet, this calling can be illusive. You may be wondering, “Am I on my right spiritual path and fulfilling my life purpose? Am I being and doing what I planned for this life?” This unique book helps you look at your life from your soul’s perspective. Nancy Canning has worked with thousands of clients since 1980, helping them transform and improve the quality of their lives. She loves her work and feels honored to be part of the healing journey of so many people, from so many places around the world. She has her Master’s Degree in counseling psychology, is a certified clinical hypnotherapist, international workshop facilitator, engaging teacher, trained psychic, and is certified in past lives and journeys into the afterlife. Nancy offers private sessions in person in Cape Cod, MA, on the phone, and via Skype. Visit her web site, www.NancyCanning.com for details on all her offerings and to arrange a session. Great show. Very different from former interviews but I would listen to anything you produce because I find them all very informative. High praise ti you for your dedication in bringing us this knowledge. I appreciate your feedback. Best wishes to you. I had been wondering if friends and relatives who had crossed over could be our spirit guides and clearly (from the recording of the woman with the near death experience) they can. So often you hear that our guides are assigned to us at birth, but this guide must have come along later in the woman’s life, so that was interesting to me. I could have a relative who has passed as one of my guides! Yes, I answer this question directly in my book, but briefly here… a deceased friend or relative can become a guide (one of them) although not our key or main guide, since our main guide is with us for our entire life. In most cases, deceased friends and relatives tend to guide us in one particular area of our life–work, relationships, health, spiritual growth, courageousness, this sort of thing. Good question. Hi Bob. I’m always so excited to see in my email a new show from you to listen to. My spiritual Journey..Thank you so much for all you do. I have found my life’s purpose . helping others know the know. Wow, what a beautiful story. I thank your telling me. It touches upon the subjects of coincidence as evidence of guidance (God’s wink, as you wrote), taking your calling as a nurse home to care for your mother (the circle of life), and now finding your purpose to help others toward knowing. What a story! Thanks for writing. Hi, Bob; digging the new format! Have to say your Answer to Jack’s question was outstanding; very well orated!! Btw, a couple questions for ya’: Do we, like say in the beginning before we do the human experience thing, do you think we come here as different animals, insects, etc. before working our way up to the human experience and as far as reincarnation goes, have you read the book, Soul Survivor and if so, what did you think? keep up the excellent work, my friend! Great question. I do believe we have lives as different species, even as different species in different universes & dimensions. But not necessarily before we experience human lives. Everything is happening at the same time, so there’s no chronological order as souls. Plus, although we might see going from animal to human as progression, there’s many reasons to believe that the progression would actually be from human to animal. Dogs with their unconditional love are one great example. Thanks Ric! Ah, yes! I forgot about the timelessness and everything happening simultaneously. That would make perfect sense, then, that there wouldn’t be a hierarchy of all the lives being lived through the soul’s perspective, I really like the concept of humans-to-animals, though; makes perfect sense, too! Thanks, Bob; that’s why you’re the Sensei of the afterlife! Thank you for your comments. I’m glad Afterlife TV has been helpful to you, and I appreciate you telling me. I need reminding ever so often, and today happened to be one of those days. I look forward to your stories if and when you feel the desire. Bless you. Wonderful show, Bob! I immediately purchased Nancy’s book after hearing her on your show, and I am very grateful to learn from you and your guests! though they are. I find it easier to focus on what is being said when i can see the person speaking. Just a thought. I appreciate your feedback and certainly understand. Right now, this is the way it will be because I’m following what my heart is guiding me to do. But you never know what the future will bring. We’re all on a journey here that is in constant movement. As I said in the first new show, sometimes we change and then end up right where we began. Hello once again, Bob. 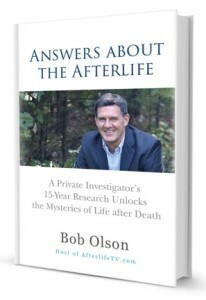 It doesn’t matter to me if you are interviewing someone or instead doing a recording of totally intriguing bits and pieces around the subject matter of life after death. It’s fascinating “stuff” no matter how it’s presented. Thank you for all of this. I’m glad you like it. Thanks for writing. I thoroughly enjoyed this episode! I have read your book and learned so much from it, but really understood a lot more listening directly to you. I love your interviews as well, but there is just something about you speaking of what you know. This episode was packed with great substance and knowledge. Please keep up the great work that you do. Thank you. I’m glad this is your experience. There are words and then there are words spoken. The voice holds a vibration that takes the vibration of the words to a new level. And of course every voice has a different frequency. The vibration of words plus voice will not resonate with everyone since not every is a vibratory match. But I’m happy that it matches with yours–that’s what resonance is all about. Bless you. Another uplifting evening listening to show number 2, could not wait for it. Just love the story about your wife giving you the book and what a beautiful story about 2 people dating at a young age and still together after all these years. Bob keep the shows coming! Cannot get enough of them! Thank you for your amazing work and for sharing your wife beautiful pictures! Thanks for such nice feedback. I’m working on the next show now, so next week it should be done. Nice to hear from you Monique. Great show!!! When you discussed absorbing wisdom and raising your vibration through ‘spiritual experiences’ —— that really resonated with me. I tried to bring this ‘additional awareness’ out on a board with a number of meditators but probably used the wrong words. Most replies indicated they were ‘amazed’ that I got so much out of meditating and one inferred what I was ‘getting’ was way beyond what one should expect. I told her maybe expect more and get more. That’s funny. I always laugh when I write something or say something that gets misinterpreted. I’m happy that resonated with you, Ray. Thanks for writing. Great and inspiring show! I always enjoy your show and this is a great extension of information to your book! Thank you for what you do and continue inspiring us! Thank you! I appreciate you taking the time to write me. How very kind. And since you obviously read the book too, thanks for all your support. I much enjoyed your talk with Nanci Danison (of columbus) and have since gotten her books, it was very hopeful when you said most of us will get what we expect to or truly want from our heart, I sure hope someday in another higher up dimension I am able to find a girl and get married !! I don’t like being alone all the time, very difficult, I am aware it is hard work to keep it together but it would sure be worth it to have someone to love for real. Thanks for your comment. I hope you find love and get married in this life and dimension. I believe there is a special someone for everyone. Hi Bob, I am 60 years old now, and wonder if it’s ever too late to fulfill my soul’s purpose? It’s never too late. For many people, the first 60 years are preparing them for it. The “between life” is merely the spirit world–where we go between lives, also known as our true home. The “life review” is what we experience after our human life ends–it’s how we look back at our life (now as a spirit) to evaluate our human choices. The “everything happens at the same time” is a concept that only matters to those on the spiritual dimension. All that means is that time isn’t what we think of here as humans on the physical dimension. But I wouldn’t worry too much about that last one other than to know time is experienced in a different way when we are in spirit.